5 out of 5 stars based on 29 ratings & 29 user reviews. We specialize in the beautiful transformation of spaces. We strive for and thrive on our customer’s satisfaction! I work for a technology integration company in the Conejo Valley area, and over the years we have used and referred several different custom cabinet builders and fabricators. These days Jim Doolittle with Doopoco Enterprises is the ONLY person I recommend to my clients, because I know that the work will be absolutely top-notch and that he will take care of my client the way that I do. Every time I refer Jim I know that my client will be handled with utmost professionalism and care, and not once has any client regretted their decision. In the dying age of customer care, Doopoco Enterprises is a refreshing change and they are a company that I will continue to refer for years to come. Excellent craftsmanship. Worked with Doopoco Inc. for our built in entertainment center. James was great, very professional with many ideas. Designed the built in based on our needs (we have 2 small kids and needed storage). Once the design was approved, installation was quick!! Would definitely recommend. Was a pleasure doing business with this company. Jim did a fantastic job designing and building our custom cabinets, we are thrilled with the final product. It was a pleasure working with Doopoco, their schedule was right on and there were no surprises. Jim was very responsive to our calls and emails. I felt like they wanted to deliver us the best cabinet and and took pride in their work. It was a pleasure working with such a professional company. Jim and the Doopoco team helped with design and development of a custom entertainment center for our family room. Jim provided ideas and guidance on color, styling, etc. and was able to advise on the stereo system and how that should be set up within the cabinetry. The job was completed on time and within the budget quote he gave us following our initial consultation. We are extremely happy with our selection of Doopoco Enterprises to design and build our entertainment center cabinetry. Jim’s vision and creativity, as well as his ability to integrate form and function, are extraordinary. He is very inclusive of his clients in the design process, and his entire team demonstrates great attention to detail. We had a wonderful experience and would highly recommend Jim and his company to others. 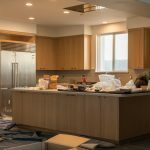 We had a total kitchen remodel by Doopoco Enterprises. The final product was of the highest quality and craftsmanship. They were always prompt and did a very good job of sticking to the time-frame that was originally laid out for the project. Jim and his crew were very helpful and friendly and professional while constructing our kitchen and media center. I would highly recommend this company to anybody who would be interested in having their kitchen remodeled or having a media center made for their house. The Team at Doopoco was great! We enjoyed working with them every step of the way. The craftsmanship of our cabinets is second to none. We are so happy that we put these projects in the capable hands of Doopoco. Very positive experience with Doopoco from the initial estimate to the final installation. Very creative design. Excellent attention to detail. We had a large entertainment niche. Jim designed a built-in that has transformed the room. The speaker grills really make it pop. Doopoco built an entertainment center for me. It houses my TV and shelves with lighting for several art objects. His workmanship is excellent. He used detail that tied in with the rest of the room. The wood he used is beautiful and I am very happy with the unit. There was one small problem with the lighting but it was fixed immediately. I was referred to Jim Doolittle of Doopoco Enterprises in the spring of 2012 as a great source for cabinets for our kitchen remodel. He did such a terrific job that we re-hired him for our bathroom remodel in early 2014. I give him an A+ from start to finish. I would definitely refer Doopoco for any cabinet job. renovation of master closet – beautifully done and well designed. Doopoco was easy to work with and made the process easy. Overjoyed with the outcome! “Doopoco Enterprises built my dream kitchen for me back in 2008. I am an avid cook, and every day I use it, I am still wowed by not only its beauty, but its functionality and perfect fit for my lifestyle. We also had him re-do our den into a home theatre room. Jim designed and built custom LED lighting housed around the perimeter of the ceiling, created a beautiful, unique entertainment cabinet, and matched it all with a new fireplace mantel. Everyone who sees this room marvels at it!. My husband and I rarely go to movie theaters anymore. It’s much better in our home theatre. The cabinet houses and vents all the equipment and we don’t have to open the cabinet doors for the remote to work or for the equipment to stay cool. In 2013 Jim designed and completed a custom work space for my home office nook. Now I look forward to using a space that I previously shunned. I have more storage space than I know what to do with (yet!) and everything is ergonomically within reach and well lit. But perhaps the best part of the Doopoco experience is the integrity with which Jim and him team complete their projects, from the very first phone call to the installation of the final piece. Jim has a talent for listening to his customers and translating their needs into works of art that are stunningly beautiful and a joy to use. He stays in communication throughout the project to inform and elicit feedback so that one is never left wondering what is happening. My wife and I were tired of looking at our outdated brick wall in our living room, so we looked around for a company that could build a custom entertainment center to transform the space. After having a few contractors come out to take a look, Jim from Doopoco gave us the most confidence that we would expect a job well done and out vision realized. Not only did he work with extreme precision, but he also coordinated continuously with the other vendors for the project (i.e. audio, components, etc) to ensure everything flowed nicely and as needed.